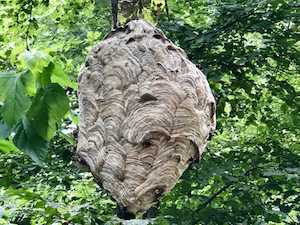 » Wasp Nest – What do you do about it? Wasp Nest – What do you do about it? Before you grab that areosol can of wasp and hornet spray, consider this. If it is not bothering anything why bother. Come late fall those wasps will abandon the nest, never to return and die off. The fertilized queen will also leave the nest to hibernate over winter in some crack or cranny. Throw a rock or take a hefty swing with your Louisville slugger be prepared to run for your life and in the process get stung several times. Unlike honey bees wasps can sting multiple times. As I remember from a rock throwing experience from my youth the stings are painful. Wasps are actually beneficial to our environment as they pollinate flowers in their quest for nectar to feed upon.